Happy summer friends! Renee here from Fantastic First Grade Froggies. I am in full summer mode, and what I mean by that is I let my son watch t.v. a little longer in the morning so I can enjoy my coffee at an extra slow pace. It's also giving me a chance to revise a few things. One of the things I am going through and revising are my Find, Tally and Graph activities. I have them in just about every theme, so the revisions may take a while. My kids love these things and I keep them in a binder so they can choose them for early finisher work. I thought this year I would print off my birthday find, tally and graph and give them to my students to take home as a birthday gift. I think they would enjoy working on a special one at home with their family. 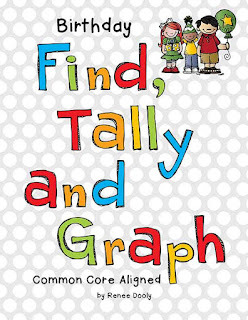 You can grab the birthday Find, Tally and Graph freebie below. If you are interested in other themes, check them all out here.